Popular potato varieties available to grow in the UK. Potatoes are divided into three groups. First early that are ready after approximately 100 days/12 weeks, second early are ready after 115 days and maincrop potatoes are ready after 130 days. If space is at a premium, plant first early varieties, which will free up the veg patch sooner or plant in containers on the patio or unused pathways. First early varieties are less likely to be damaged by pests. Harvest second earlies from the end of June to the start of August. Maincrop potatoes are probably the most recognisable varieties and they store well. Harvest maincrop potatoes in August, when the foliage starts to die back, but leave them on the surface of the soil for a couple of days for the sun to dry the skin, this helps them last longer in storage. Some potatoes (i.e. 'Charlotte) can be grown as late season potatoes. Plant in July or early August for a mid-Winter crop. Salad potatoes are more waxy than maincrop, perfect for containers, plant in January, grow in rich, free draining compost, make sure they have plenty of water. 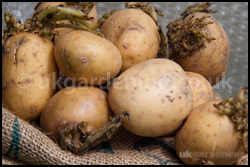 'Duke of York' a waxy, salad potato particularly when first harvested, if left they are a good general purpose potato. One of 3 varieties I grew in potato bags in 2011. 'Red Duke of York' AGM - A good all round potato with red skin and yellow flesh. A heritage potato. 'Rocket' a good disease resistance and produces a large crop or round white skinned potatoes. Easy to grow and good for growing in potato sacks and containers. 'Sharpe's Express' a good flavour, but not a large crop off of each plant and has poor pest and disease resistance. Apparently this variety was Percy Thrower's favorite potato. 'Arran Pilot' a waxy potato that is ideal as a salad or a new potato. Good scab resistance. 'Accent' AGM - A good cropper of small salad/new potatoes, pale yellow flesh, remaining firm after boiling. Good eelworm and slug resistance. Harvest from May. 'Maris Bard' - a very early salad/new potato with good yield and disease resistance. 'Mozart' - red skin with yellow flesh. 'Kestrel' a popular, general purpose, consistently shaped and sized potato with white flesh and skin with purple eyes. A good resistance to slugs and eelworm. 'Charlotte' - one of 3 varieties I grew in a potato bag in 2011. Kidney-shaped with a good flavour and decent crop size. Good for boiling and steamed, one of the best salad potatoes. Harvest from June. 'Maris Peer' - one of 3 varieties I grew in a potato bag in 2011. A firm, creamy potato with white skin and pale yellow flesh. A good salad potato ideal for boiling and steaming. Large crop size. 'Ratte' AGM, a second early, French variety similar to Pink Fir Apple, with long tubers and yellow flesh, but with a white skin. 'Belle de Fonteney' - a second early/early maincrop French salad potato with a waxy, pale yellow flesh. Stores well. 'Wilja' good yield, general purpose potato with white skin and floury flesh. 'Hunter' - good blight resistance, harvest from June. 'International kidney' used as a good salad potato or left for a little longer and dug up as an early maincrop for general use. 'Edzell Blue' purple skin, white flesh. Good for roasting and chips. 'King Edward' - a late maincrop variety with good resistance to slug damage. Great for roasting and baking, traditionally used for Christmas dinner. 'Sante' an early maincrop potato with good disease and pest resistance. Will also grow in most soil types. 'Sarpo Mira' a floury potato which stores well and has good blight resistance, a good variety to grow for the first time potato grower. 'Salad Blue' an unusual maincrop potato with dark purple/blue skin with violet flesh. 'Maris Piper' a very well known variety. Good for chipping and roasting. Stores well. 'Picasso' - large crop size, good for mashing and baking. Harvest from late August/early Sept.
'Blue Danube' also known as 'Adam Blue', purple skinned potato with white flesh. Maincrop with some blight resistance. 'Rockstar' - a new variety to Marshalls in 2014. In 1872 Luther Burbank developed a new hybrid potato with disease resistance to the blight that was affecting the world, in particular the Irish potato crop. Named the Russet Burbank it is used by McDonald's for their fries.